Metallurgical Coke Market Key Players: OKK Koksovny, a.s., SunCoke Energy Inc., Ennore Coke Limited, Hickman, Williams & Company, MECHEL PAO, Sino Hua-An International Berhad and Drummond Company, Inc.
Persistence Market Research (PMR) provides an exclusive analysis of the global Metallurgical Coke market in its latest report titled “Metallurgical Coke Market: Global Industry Analysis 2013 - 2018 and Market Forecast 2019 - 2027”. The main aim of this report is to offer exhaustive analysis and insights pertaining to the Metallurgical Coke market. This report offers a comprehensive analysis of the global Metallurgical Coke market in terms of market volume (KT) & value (US$ Mn) and year-wise (Y-o-Y) growth by product type, ash content, end-use and region. The study considers 2017 as the base year with market values estimated for 2018 and forecast developed for the duration of 2019 to 2027. The Compound Average Growth Rate (CAGR) has been represented from 2019 to 2027. The study covers value chain analysis, market dynamics and industry growth analysis, along with segmental-level projections in a comprehensive manner. As per industry experts and findings of the report, the global Metallurgical Coke market is projected to grow at a CAGR of 2.9% between 2019 and 2027, in terms of value. Metallurgical coke, also known as coke/met coke, is a carbonaceous material manufactured by the destructive distillation of high carbon content coals, such as bituminous coal, in high temperature ovens in the absence of air. Metallurgical coke is a basic raw material used for the production of pig iron and steel. Metallurgical coke is categorized into three categories based on size and ash content: blast furnace coke, foundry coke and technical coke. The Persistence Market Research report on the Metallurgical Coke market analyses the market at regional as well as global levels through market segmentation. The primary objective of the report is to offer key insights on current trends, competition positioning, growth rates, market potential and other relevant information and statistics in a suitable manner to readers and various stakeholders in the Metallurgical Coke market. The report is structured to facilitate readers to develop a thorough understanding of the Metallurgical Coke market. 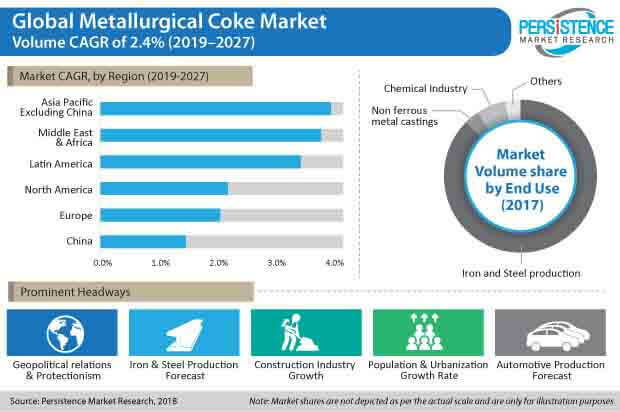 The Metallurgical Cokes market report begins with market definitions, which are followed by market taxonomy, market background and market dynamics and an analysis of the market by key segments, regional market analysis and competition assessment. Each section of the report covers a quantitative as well as qualitative assessment of the Metallurgical Coke market on the basis of historical developments, facts and key opinions collected from the market participants in the Metallurgical Coke market through interviews. In the next section, the report describes the Metallurgical Coke market structure, macro-economic factors, forecast factors, regional weighted average pricing analysis and provides an overview of the value chain along with profitability margins and an indicative list of the key stakeholders involved in every stage of the Metallurgical Coke market. The next section of the report provides value (US$ Mn) and volume (KT) projections for the Metallurgical Coke market on the basis of respective segments at a global level. The global Metallurgical Coke market values represented in the section have been agglomerated by collecting data and information at a regional level. The Metallurgical Coke market information along with key insights and facts cover unique analysis frameworks, such as year-on-year growth trend comparison and share analysis, for each of the sub-types of the segments covered in each segment. The subsequent section of the report presents a summarized view of the global Metallurgical Coke market based on six prominent regions considered in the study. All the above sections evaluate the present market scenario and growth prospects in the global Metallurgical Coke market while the forecast presented in the section assesses the market size in terms of volume and value. Market numbers, pertaining to regional as well as country level data and various segments by end use, have been estimated through a combination of primary and secondary research. Key sources referred to arrive at the global Metallurgical Coke market size include Metallurgical Coke manufacturers, suppliers, end-users, industry association & trade experts and secondary documents available through public domains, paid databases and PMR’s in-house data repository. In order to offer an accurate market forecast, PMR’s proprietary regression analysis forecast model was then utilized to derive the market estimation for forecast years, which takes into account the effects of certain direct and macro-economic factors, such as global GDP growth, steel production outlook and growth outlook for other industries in the global and regional Metallurgical Coke market. The pertinent opinions of key primary respondents for specific segments and geographies were also taken into consideration for forecasting the segment level market size and dynamics in the global Metallurgical Coke market. In the final section of the Metallurgical Coke market report, the competition landscape for the Metallurgical Coke market has been included to provide report audiences with a dashboard view, categorized on the basis of providers present in the value chain, their Metallurgical Coke market presence and key differentiating strategies. The primary category of providers covered in the report includes Metallurgical Coke manufacturers. This section is primarily designed to provide clients with an objective and detailed comparative assessment of the key providers specific to a market segment in the value chain of the Metallurgical Coke market. Detailed profiles of providers have also been included under the scope of the report to evaluate their long-term and short-term strategies, key offerings and recent developments in the Metallurgical Coke market. Metallurgical coke, also known as coke/met coke, is a carbonaceous material manufactured by the destructive distillation of high carbon content coal, such as bituminous coal, in high temperature ovens in the absence of air. Metallurgical coke is a basic raw material used for the production of pig iron and steel. Metallurgical coke is categorized into three categories based on size and ash content: blast furnace coke, foundry coke and technical coke. The global Metallurgical Coke market is estimated to be valued at US$ 186.0 Bn by 2018 end and is expected to reach US$ 241.1 Bn by 2027 end expanding at a CAGR of 2.9% over the forecast period. The global Metallurgical Coke market is projected to create significant growth opportunity during the forecast period. Metallurgical coke is primarily used as a raw material for the production of iron and steel. Metallurgical coke is used for the production of almost 70% of metallurgical coke. Hence, market trends across the steel industry directly reflect on the metallurgical coke market. The growth of the construction and automotive industries are the prominent demand drivers for iron & steel. The construction sector is one of the biggest consumers of steel products, accounting for more than half of the steel demand globally. The construction industry has witnessed significant growth over the past few years and is expected to follow the same trend over the forecast period. This, in turn, is anticipated to push the growth of the global Metallurgical Coke market during the forecast period. Government led initiatives for economic diversification and increasing investments for infrastructural development are also expected to facilitate the growth in demand for steel. This, in turn, is going to create healthy growth opportunities for the metallurgical coke manufacturers. The metallurgical coke market in developing countries, such as India, China, Brazil and ASEAN countries, is anticipated to be driven by the growing construction industry. Moreover, increasing infrastructural investments for projects, such as construction of light rail corridors, office buildings and shopping centers, among others in the U.S., are expected to further fuel the demand for metallurgical coke. Another key factor significantly driving the growth of metallurgical coke is increasing production and demand for automobiles. According to the World Steel Association, the automotive sector accounted for around 12% of the global steel consumption. Steel is used is the manufacturing of vehicle body structures, drive trains, cast iron for engine blocks, suspensions, fuel tanks, steering, breaking systems and various other components. Thus, any growth is automotive production, significantly drives steel demand, which in turn, translates into the growth of the metallurgical coke market. One of the key trends observed across the global metallurgical coke market universe is increasing investments to improve productivity and overall efficiency of coking ovens. Furthermore, growing environmental concerns and stringent regulations are driving metallurgical coke manufacturers to upgrade and reconstruct their production plants. The global Metallurgical Coke market can be segmented on the basis of product type, ash content, end use and region. Based on product type, the global metallurgical coke market can be categorized into blast furnace coke, foundry coke and technical coke. On the basis of ash content, the Metallurgical Coke market can be categorized into low ash content and high ash content. On the basis of end use, the market is segmented into iron & steel production, non-ferrous metal casting, chemical industry and others. Based on regions, the Metallurgical Coke report discusses North America, Latin America, Europe, Asia Pacific Excl. China, Middle East & Africa and China. By region, the China metallurgical coke market is anticipated to account for more than half of the volume share in the global Metallurgical Coke market. Demand for metallurgical coke is increasing owing to the presence of a large number of steel manufacturing plants and growing automotive production in the region. The Asia Pacific Excl. China (APEC) region is expected to be an opportunistic market during the forecast period. The metallurgical coke market in APEC region is projected to grow at a CAGR of 4.6% during the forecast period. India and ASEAN countries are expected to push the growth of the metallurgical coke market, while Japan and South Korea are expected to witness relatively stagnant growth during the forecast period. The Europe Metallurgical Coke market is estimated to account for about one-sixth of the market volume share in the global Metallurgical Coke market. The demand for metallurgical coke in North America is expected to experience healthy growth in near future. The growth of the market is being driven by the protectionism policies being adopted by the U.S. government and implementation of antidumping duties on steel imports across the U.S. The global Metallurgical Coke market is moderately fragmented, with the top 8 players in the market collectively holding about 50% - 55% of the global Metallurgical Coke market. Some of the key competitors covered in this Metallurgical Coke report include OKK Koksovny, a.s., SunCoke Energy Inc., Ennore Coke Limited, Hickman, Williams & Company, MECHEL PAO, Sino Hua-An International Berhad and Drummond Company, Inc.
How has the Metallurgical Coke market evolved in the past four years? What shape is the Metallurgical Coke market expected to take, in terms of value and volume, during the forecast period? What are the dominant market dynamics in the Metallurgical Coke market? How is the competition landscape at the moment and what are some of the trends in the Metallurgical Coke market? What are the prominent challenges, opportunities and drivers for the Metallurgical Coke market players? How is the competition structured at present and how has it advanced in the Metallurgical Coke market over the past few years? Jiangsu Surun High Carbon Co.,ltd.